This morning I had to slow down in the children’s books section of the Friends of the Westport Library Summer Book Sale. I slowed to sort through the extensive offerings of books on tables in the big tent. I also slowed to keep an eye on three-year-old Pearl, my niece’s daughter, in the smaller tent. That slowing down resulted in a great payoff in picture books. This memoir is an assigned text for the Honors Grade 10 summer reading, a non-fiction selection to meet the World Literature focus. The seven copies would retail for $74.90; I got all of these copies for $13.00. There were other trade fiction paperbacks that I added: Little Bee; Cry, the Beloved Country; and The Things They Carried. There were also multiple copies of different episodes in the Bone series for students who enjoy graphic novels. After shopping for the classroom libraries, the browsing through the children’s books tent felt like a bonus sale. Here was an opportunity to get books into Pearl’s hands, and the Westport donators did not disappoint. The tables were piled high, and the aisle wide enough for patrons with small children in tow. 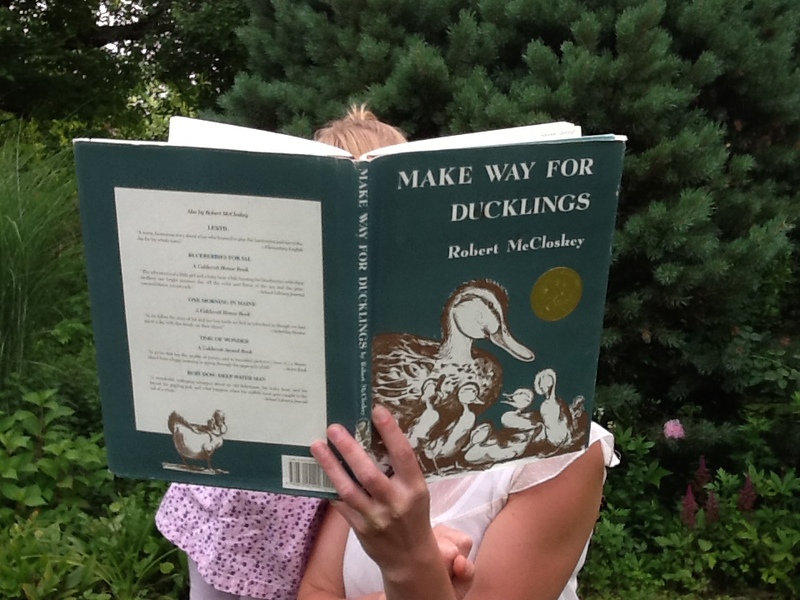 Make Way for Ducklings by Robert McCloskey. The True Story of the Three Little Pigs by Jon Scieszka and illustrated by Lane Smith. The Five Chinese Brothers by Claire Huchet Bishop and illustrated by Kurt Wiese. We had to stop and read some of the books to Pearl to keep her engaged and were particularly grateful for the large areas roped off outside the children’s book tent. This space lets patrons check their selections before heading to the check-out tent. This space is critical for some of the patrons who stock up like I do with multiple bags and boxes. In total, we spent an hour collecting books at the sale and fifteen minutes at the organized check-out tables. As they are every year, the volunteer who counted my five bags full was pleasant and well-trained. She was curious about where I taught, however. “You are putting these into classrooms…where?” she asked. I explained these were going to a middle/high school in Northwest Connecticut. “Oh, I don’t know that area well…I guess I lean more to the New York area,” she offered. “When possible, so do I,” was my response. Totals spent? $96.00 for the classrooms, and $13.00 for Pearl who left the sale toting her “summer reading” picture books. From emerging to life-long readers, the Westport Book Sale offers a chance to stock up on picture books and memoirs and all the other genres in-between.